Louise Speaks: After touring the local resorts of Palm Springs, and of course seeing Elvis’s honeymoon retreat we headed up to The Aerial Tramway. This is probably one of the most famous attractions of Palm Springs. 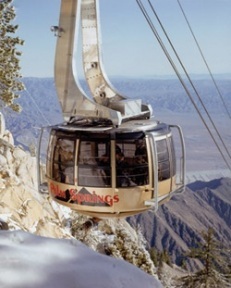 Aboard the Palm Springs Aerial Tramway, www.pstramway.com the world’s largest rotating tramcar, you will experience a breathtaking journey up the sheer cliffs of Chino Canyon. Begin the 10 minute ride at the Valley Station – elevation 2,643 ft. and end at the Mountain Station – elevation 8,516 ft. No matter what the season, whether you are enjoying spectacular views or hiking in a pristine wilderness, a one-of-a-kind experience can be had by all. The tramway did not just happen. It required foresight, planning, financing and, most of all a vision. For years, it was the dream of a young electrical engineer named Francis F. Crocker who wanted to “go up there where it’s nice and cool”. Crocker’s dream began in 1935 while he was on a trip to Banning, California, with newspaper publisher Carl Barkow. Mopping his brow in the heat of the day, Crocker gazed on longingly at the still snow-capped peak of Mt. San Jacinto 10,834 feet high. At that moment, “Crocker’s Folly,” as it was soon dubbed by one newspaper woman, was born. Francis Crocker’s dream was completed in 1963; the inaugural ride occurred on September 14th with scores of local and state dignitaries and celebrities on hand. In 1966 a 7,800 ft. granite spire in the canyon was dedicated to Coffman who died in August 1967; Francis Crocker died in 1992. The Tramway announced in 1998 that it was embarking on a modernization program that would see the construction and installation in 2000 of new cars and updating of its facilities. Beginning in September 2000, passengers rode the world’s largest rotating tram cars, constructed by the tram’s original car manufacturer, Von Roll Tramways. More than 12 million people have been safely transported by the tramway into the majestic mountains overlooking the Coachella Valley since the attraction opened in September 1963. We only spent about an hour at the top enjoying the views and visiting every lookout station. The Peaks restaurant offers a wide variety of menu items for both children and adults. It is also available for special occasions such as weddings and private parties. We did spend time in the gift shop which had unique gift ideas and of course tons of souvenirs. Although this was a fun “cool” way to spend the afternoon, and tickets are very affordable, I would only rate the tramway a C. Maybe it’s because I had been on the tramway before, or maybe I just didn’t find it that exciting . Thelma Speaks: Now Louise from this flat lander I enjoyed the ride. I liked spinning around as we climbed! You did turn a little pink at first but you made it. The day we were at the top it was cool and snow was still found. Some brought sleds up to enjoy the ride. Hot chocolate was being consumed. You can eat in the restaurant or get something to take outside from the snack bar. There are shops to find your tourist treasures and if you want to take a hike, there are paths to follow. We took the tram down and headed on to our next adventure. The day we were there the sky was overcast and so seeing downtown was not easy. I agree it was affordable and I enjoyed the ride which is similar to those in other cities. I would rate this tram a B as it is a larger spinning adventure to the top of the mountain where you can make your own fun eating or walking, hiking or shopping. Categories: Attractons, California | Permalink.